A huge thanks to everyone who helped to make Friday Night’s Comedy Night our most successful one ever! We raised a fantastic £3,315 and we can do a whole lot of good with that. Our thanks go to comedians Michael Fabbri, Nas Osmanoglu and Spring Day. They had over 180 guests in stitches and it was all ably compered by Jim Grant of Oi Oi Comedy. Acorns Trust  Acting Moon Events  Aspray  CBL Fastenings  Federation of Small Businesses  King Cabinet Makers  MW Solicitors  PMA Scaffolding  Reactive Plumbing  Social Bee. Thank you to everyone who donated raffle prizes which raised £500. Including Touchstone, David & Vicki Beck, Sandra Forte, Tangles Hairdressers, Pomodoro e Mozzarella and the Royal Eastbourne Golf Club. We’re grateful as ever to everyone at Langney Sports Club for giving us the venue free of charge and for all their support towards the event. A massive thanks go to the Comedy Night Committee: David & Vicki Beck, Derek & Helen Blaney and Sandra Forte. 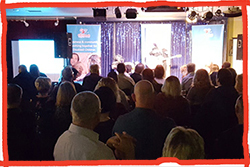 This was our 13th Comedy Night, which to date has raised almost £30,000 for the important work of the Children’s Respite Trust since our first one in 2012, so thank you to everyone who has supported these events over the years. We look forward to welcoming you back to Langney Sports Club for more laughs on Friday 15th November 2019.